We know how wine connoisseurs want to invest not only in high-quality and expensive bottles, but also in the technology needed to take care of their passion. That is why we have designed a special high-tech product for the most stylish wine lovers out there: a thermoelectric wine cellar. Because it comes with the latest technology that will give you the opportunity not only to take care of the best bottles of red and white wine, but also to better protect the opened ones with the help from the new and unique shelf system where you can place opened bottles. Don’t forget about the dual zone function that allows you to control the temperature, so your wine stays in the perfect environment. THE ULTIMATE WINE ACCESSORY: if you are a wine lover, then you probably already have all the special glasses, bottle openers and aerators, but now it's time to think about the best way to store your favorite drink: the thermoelectric wine cellar will take care of your best wines when it comes to the perfect temperature and air pression! 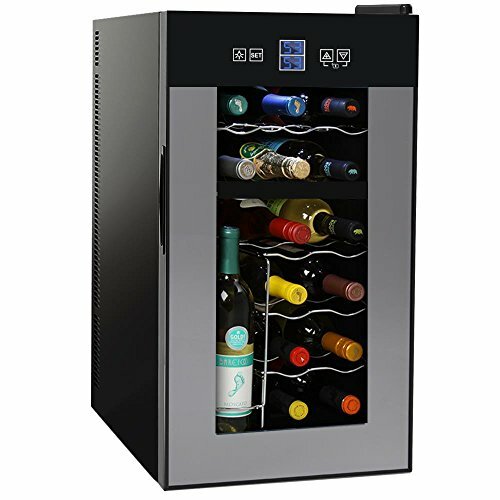 PERFECT DUAL ZONE TEMPERATURE: our wine chiller comes with the latest high-tech options, including dual zone through which you can precisely set the temperature you want (in Celsius or Fahrenheit) with an upper zone of 46-64°F (8 - 18°C) and a lower zone between 54-64°F (12-18°C), but also LCD digital thermostat display and touch controls. A NEW TECHNOLOGY: taking care of your old bottles of wine is always difficult, but keeping the flavor of the already opened bottles is even harder. We have created an innovative system with vertical shelves that allows you to store even the opened bottles in the cellar so you never have to waste the quality of your favorite wine. A STYLISH TOUCH FOR YOUR HOME: the wine chiller is not only a practical way to store the expensive wine bottles you've purchased, but also a fashion statement. You always want to add a stylish piece to your kitchen or home office, so the wine cooler is the perfect classy accessory for any a connoisseur of fine wines. PERFECT GIFT FOR WINE LOVERS: if you too have that friend with an affinity for high-quality wine, then the perfect gift you could make him is our wine cellar, an elegant and practical present through which you can express your sincere appreciation.